You've probably witnessed your dog panting hundreds of times, but did you ever wonder why he does it? Dogs and people have very different ways of cooling their bodies down when the heat becomes too much for their systems too handle. Picture this: you're mowing your lawn on a sunny afternoon in July. The temperature is in the upper eighties, you're working hard and there's no shade in sight. Gradually your body becomes so warm you start to feel wet. Sweat sprouts on your forehead, your hands feel slick on the mower handle, and your shirt begins to show those tell-tale dark stains. Every once in a while, a breeze stirs, and you feel just a little cooler as the wind moves across your moist skin. This is your body's evaporative cooling system at work, aided by its numerous sweat glands. It's fairly effective at keeping your core temperature reasonably close to that optimum 98.6 degrees. Dogs, on the other hand, only have a few sweat glands located mostly in the pads of their feet. 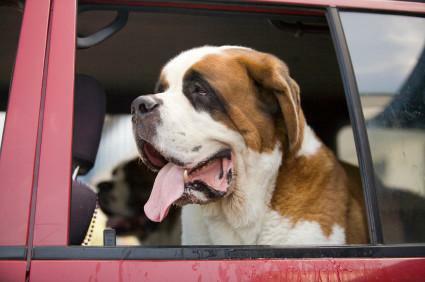 Since the majority of breeds are covered in fur, canines have to find an alternative way to release excess body heat, and this is where panting comes in. Panting is your dog's primary way of cooling off. The normal rate of canine respiration is about thirty-five breaths for minute and this type of breathing uses a major portion of your pet's lung capacity. As panting sets in, your dog's respirations increase nearly a hundred fold to almost four hundred breaths per minute. This type of rapid breathing is quite shallow, only using the upper portion of the respiratory tract. The air is quickly forced back and forth over the moist tissues of your pet's mouth, creating a smaller version of the human body's method for evaporative cooling. Under normal circumstances, your dog will pant intermittently as his system calls for it to keep everything regulated. The panting will be interspersed with periods of regular breathing. This accounts for why your pet only pants for a few moments and then returns to normal. Your dog may naturally pant to catch his breath after running, or to cool down when he's warm, but there are times when panting can be a sign of bigger problems. Being overweight puts a tremendous amount of strain on a dog's body, especially on the heart and respiratory system. If moderate exercise such as a walk around the block causes your dog to pant, it's time to pay a visit to your vet. He or she will give your pet a complete examination to diagnose the exact reason your pet is short of breath and advise you on a healthy weight loss program that should relieve some of your dog's discomfort. An advanced case of heartworm literally chokes a dog's heart muscle and a consistent shortness of breath is one of the outward signs of an infestation. Heartworm can be prevented by having your pet tested annually and putting him on a preventative as recommended by your vet. Prolonged panting may be a sign of dangerous over-heating. A dog's normal temperature is approximately one hundred degrees, but as your pet's core temperature rises above one hundred and two degrees, his system begins to go into distress.Left unchecked, heat exhaustion can quickly progress to heat stroke, resulting in possible death. Always make sure your pet has plenty of shade. Make water available to your pet on a constant basis and freshen it several times a day. Be sure your pet's location has good ventilation. Never leave your dog locked in a car on a warm day. It's normal and actually quite healthy for your dog to pant for short periods of time. However, excessive panting that continues without a break or shortness of breath after mild exercise can both be signs of trouble. If you suspect your pet is experiencing some level of distress, try offering him a little water and wait a few moments to see if things settle down. If they don't, it may be prudent to seek help from your vet.